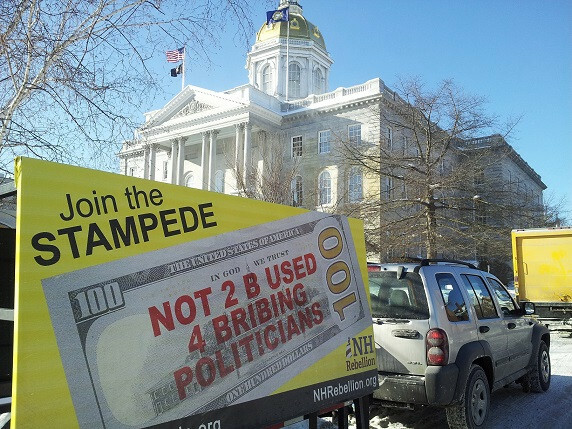 On March 7, 2018, New Hampshire’s House of Representatives passed a bill — HB 504 — calling on Congress to pass an amendment to the U.S. Constitution to overturn Citizens United and STAMP big money out of politics for good. If it passes the New Hampshire State Senate, New Hampshire will become the 20th state to formally call for an amendment. That’s more than half the states needed to ultimately ratify an amendment! The vote today demonstrates significant progress on the road to winning an amendment and guaranteeing a government that works for everyone. But we’re not there yet. If you live in New Hampshire, take action today. Call your State Senator and ask them to support this bill to get big money out of politics. For the rest of us, stamp a bill in celebration and stamp 100 more to show your representatives that we’re not stopping until we win. To date, 19 states and over 800 cities and towns have passed resolutions calling on Congress to amend the U.S. Constitution to fix our democracy. That’s more than 50 percent of the states need to ultimately ratify an amendment. Learn more about the movement to overturn Citizens United and how you can get involved!